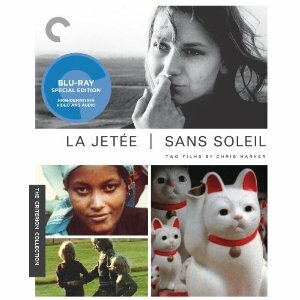 La Jetée and Sans Soleil are extremely different films, though they are the two crowning achievements in the eclectically magnificent career of Chris Marker. Marker is not a filmmaker as much as he is an artist, who occasionally uses film as a medium, the way a painter may switch from oil to watercolor, or a photographer varied lenses. One could use all sorts of words to describe Chris Marker; writer, photographer, filmmaker, editor, videographer. I prefer artist. Indeed, these two films have often been shown on exhibition at museums, and each defies the longstanding methods of mainstream cinema. Remarkably, they were also made twenty-years apart in the enigmatic career of French filmmaker Chris Marker. La Jetée (1963) is a short film which was later a great inspiration for Terry Gilliam’s 12 Monkeys. Involving space travel and death, this doesn’t sound like an avant-garde film, but what makes it unique is the manner in which the film is presented. Rather than a moving picture, we are given images, photographs taken by Marker. And rather than dialogue, we are given narration, as a story would have. It is more like a moving storybook than a film, but the final result of this unique science fiction film is astonishing. Sans Soleil (1983) couldn’t be any different in many ways, although the reliance on voiceover for facts rather than dialogue is again present. It plays out like a travelogue, showing the footage from a tourist’s trip to Japan and Africa. Often it jumps back and forth, juxtaposing the two together. As the raw footage plays out we are read letters from a man named Sandor Krasna, read in voice over by Alexandra Stewart (Florence Delay in the French-language version). The images are often simple, though they are paired with unfathomable life questions and musings. Then there are times when the images are horrific, such as the shooting of a giraffe, and we wish that the words were more profound. By the end of the film, we feel as though we have been on this journey, and never actually seeing the writer of the letters or the man behind the camera allows us to step into his place. The Blu-ray release puts both of these modern classics on one disc, in glorious restored high definition digital transfers, approved by Marker himself. The disc also includes two interviews with filmmaker Jean-Pierre Gorin, who discusses the influence of Marker. The special features also include a video piece on Marker called “Chris on Chris,” created by critic and filmmaker Chris Darke, and two excerpts from the French television series “Court-circuit (le magazine). The highlights of the special features, however, are a pair of features about the inspiration of other works. One is about the influence of Alfred Hitchcock’s Vertigo in the making of Sans Soleil, while the other is a look at the influence of La Jetée on David Bowie’s music video for “Jump They Say.” There is also an additional short film co-directed by marker and a 45-page booklet with essays and articles by a collection of critics and experts, as well as Marker himself.